INDUCTION - Sting and the Guard Bird - Memo to WWE: Induct the Bird! We Did! - WrestleCrap - The Very Worst of Pro Wrestling! I know a lot of folks who are really excited about Sting going into the WWE Hall of Fame. Without question he deserves the accolades being thrown about. While he was never one of my personal favorites, he generally seemed to be a guy who did what he could with whatever he was given. He never seemed to go half speed, whether he was battling the likes of Vader or Hulk Hogan or Ric Flair or a mysterious magician descending to the ring from a space ship…who…was also Ric Flair. Ah, Crow Sting…now that would be the one that made the man truly famous. 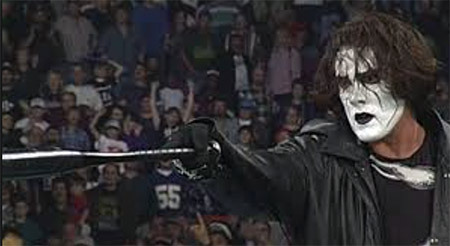 Long story long, Sting had been labeled as a traitor by his WCW compatriots, and thus completely changed his look to that of Brandon Lee’s character in the movie The Crow. He then proceeded to hang out in the rafters for over a year, saying nothing, yet silently stalking the evil (well, in theory) n.W.o. before finally emerging to battle Hulk Hogan for the biggest pay day the company would ever see. Of course, this being WCW, they botched the entire match and things quickly spiraled out of control. Someone (you) should write read a book about that (which you can order…rightchere!!!). Wait, what? 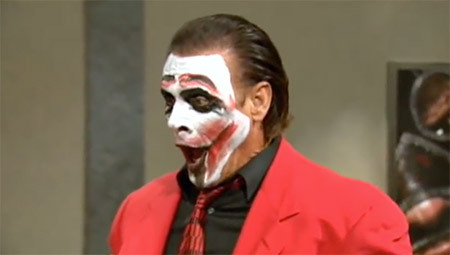 You never saw Joker Sting? 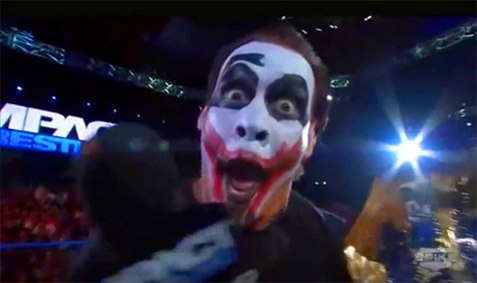 Because oh…oh oh oh….oh how I loves me some JOKER STING!!! 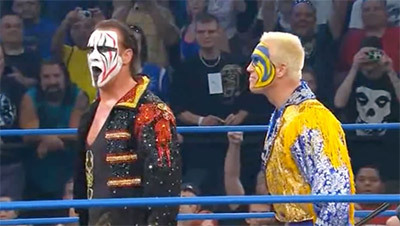 Look, it will be great to see Sting going up on the stage to “THANK YOU STING” chants and all that jazz…but something will truly be lost if we don’t get footage of this legendary portion of his career. 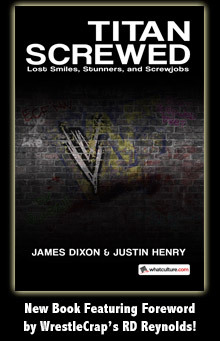 One can only hope that cooler heads prevail and Vince offers Dixie a pittance for the rights to some clips. I bet he could get them for an RC Cola and a Moon Pie. Heck, maybe just the Moon Pie. For those unfortunate souls that had not born witness to Joker Sting, a bit of a recap. He was feuding with Mr. Anderson (Kennedy, for you old timers) who had taken to mocking Sting by dressing up as him. It’s generally awful when this happens, and yes, I’ve inducted two such occurrences – the 1990 Halloween Havoc Hoax, when Barry Windham, who was a good 5 inches and 50 pounds larger than Sting did it, and the 2000 Halloween version of the very same event when Jeff Jarrett decided to pull it out of the mothballs. Both are in the archives, read up and enjoy. Having seen this hackneyed idea rearing its ugly head yet again, Sting went completely bonkers and started smearing red lip stick on his mug. I truly hope for Sting’s sake Shawn Michaels isn’t reading this. That could make for a very uneasy night for Mr. Borden at the Hall of Fame. Steve, if you are reading this, just take this word of warning: if Shawn sneaks up behind you and asks, “Do you feel that”, run for the hills. 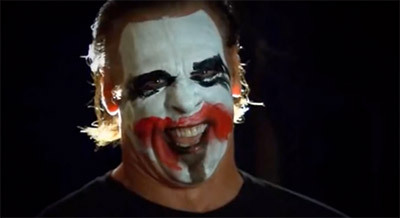 Oh yeah, with the Stinger going off the deep end and morphing into a pro wrestling version of Heath Ledger’s famous Joker character from The Dark Knight. While he looked like Ledger, he didn’t really act like Ledger. 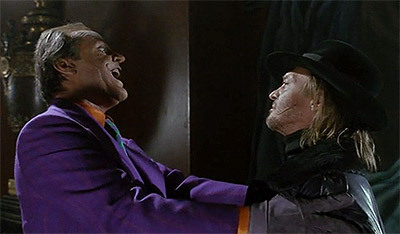 And he definitely didn’t SOUND like Ledger; he was more Jack Nicholson’s Joker from the 1989 Batman. Actually, that’s not entirely true either. He was more Jack Nicholson when he was imitating Jack Palance (Boss Grissom). Had he only grabbed Eric Young by the shoulders and told him, “You…are my number one…guy…” I bet TNA would still be on Spike TV and pulling ratings in the 6.5 range. The most amazing part is I believe that our friend Vince Russo was around at the time. How Russo failed to ask Sting to grow a mustache then not shave it, instead applying white face over the top ala Cesar Romero, is a question that will forever be unanswered. Or at least it will be until the next time we have Vince on WrestlCrap Radio. Stinger was able to exact his revenge on Anderson, even winning the TNA championship in the process. But no matter what titles he won or the matches he had or the interviews he gave…they all pale in comparison to the legendary night of July 28, 2011. …Joker Sting! He courteously says hello to everyone (“double bi, Scotty!”), before flopping down at Eric’s desk. He then explains to the motley crew that he’s always had a great relationship with the network, so much so that in the past week, they’ve decided to make him an executive and thus has complete control over the show. While everyone flips out, he books Anderson vs. Angle in a cage match, noting that Fortune (TNA Babyface Stable #147) would be at ringside. OH! I would be remiss in stating that he had a cage underneath a blanket. And he was walking all over the place with it…just to be safe. After all, he may run into a brute like Madison Rayne backstage! Which he did. And she screamed a great scream. At least I think it was a great scream – I may be a bit biased, as I always dug Madison. Maybe I just felt sorry for her for having one of the worst entrance themes in history, dunno. 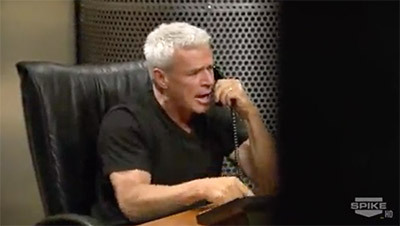 Finally, we head back to Eric’s office, and he is ranting and raving with someone from the network about he feels disrespected that they would put Sting in charge over himself. 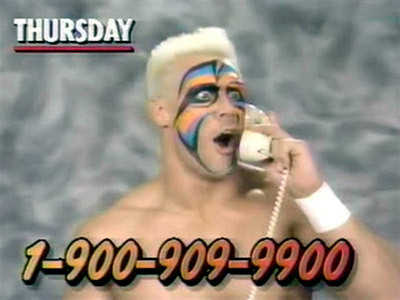 Suddenly, he goes silent…as he is told that no one from the network has talked to Sting in weeks. Sting explained that this fowl (see what I did there?) creature would keep Eric at bay so as not to interfere in the match he had booked. Why he didn’t, I don’t know, just lock the door is open for debate. Oh who am I kidding? We needed to have this bird! …that being in the 1990s, he had a vulture. Come 2011, it more closely resembled a friendly bird you may feed at you local park. Still, that didn’t cause Eric from recoiling in utter, abject fear. Like, seriously, you’ve never seen a man more horrified of anything ever. The animated GIF doesn’t really do it justice, you need this audio to go along with it. I cannot stop watching this; it’s truly Eric’s finest work ever. Sadly, that was the last we ever saw of Sting’s Guard Bird. Why he was shelved after only one segment is a complete and utter crime. One can only hope that WrestleMania weekend, Sting downs some Smilex and brings his feathered friend up for his acceptance speech. 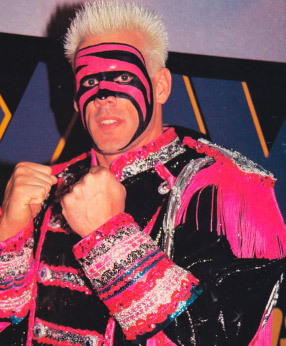 36 Responses to "INDUCTION – Sting and the Guard Bird – Memo to WWE: Induct the Bird! We Did!" YES! Bring on more TNA inductions! I’ve been waiting for Abyss’ Magic Ring, Orlando Jordan: Bisexual and The August 1st Warning to be roasted! Oh my God. Yes! All of the above. Make it happen. Almost forgot O-faced Brooke Hogan’s run in the company. Must. NEVER. Forget. Brooke. Hogan. I always cheered for Flair over Sting to be honest. Even though Crow Sting looked awesome, I was still an nWo-ite. However, seeing the way Sting was treated in WWE was sickening. 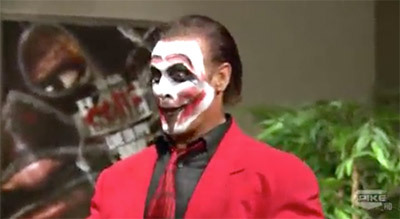 I never saw Joker Sting…but I love his look. If Sting would have brought along two or more crows, there would have been a murder. As it was, it was just an attempted murder. MoonPieLovingDixie.com! I bet that URL’s not taken! I always thought it seemed like he was doing Jim Carrey’s version of the Riddler in some aspects. Not as much as Stardust mind you, but still. I now want to know if this means we end up getting a Sting: The WWE Year induction. TNA has Sting rip-off a three-year-old movie (in 2011, that is) and gives him a bird to terrorize the heels. And, it’s still in business somehow. This is perfect Wrestlecrap: something so dumb and so silly that it just makes me laugh. Was a little surprised you didn’t riff off Sting comparing the Guard Bird to Hitchock’s “The Birds” and how he could have tormented Easy E with other Hitchcock movies, like taking him up to the rafters where he gets Vertigo. To be fair to Sting, after releasing the bird, he did tell Eric he had a key for the outside lock, from which I inferred that he also locked the door. He must have nicely let Eric out after the match was over. The Bryan and Vinny Guard Bird review of Impact done by RD’s co-author Bryan Alvarez is quite amusing as well. Looking forward to more TNA inductions from RD. Sting has had great moments, but too many times, promotions did stuff like this. Yeah. WWE should have have a LOT more time to bury Sting just to prove once again (for Vince’s idiotically fragile ego) that WWE > WCW. Cruel twist of fate, indeed. Yeah because Sting wasn’t ever essentially burying people in TNA by being the old guy who beats the young up and comers. I remember RD and Blade discussing this on an old WCR episode, with RD incredulously recounting how ” Sting said the bird was one of the birds from Alfred Hitchcock’s ‘The Birds’ “. Should’ve covered the whole Crow Sting… *ahem*… “saga”. Crow Sting from 96-97 was not in any way, shape, or form crap. Well, his look was such an obvious ripoff of a recent movie, people were rolling their eyes at the time. Granted, you can also compare him to Phantom of the Opera and Marcel Marceau! I’ve been offline for a week, so I’m just noticing this now, but I meant to say JOKER Sting, NOT Crow Sting. Though that really should have been obvious in context. um……no sir. That was WCW at it’s best. They had virtually everything clicking at that time. NWO, Goldberg, cruiserweights, Crow Sting………..there’s a reason they were crushing WWF and I was a WWF guy at the time. But we always ended with Nitro to see if the NWO was beating someone down and spray painting them or if Sting came down from the rafters and took out 27 members of the New World Order by himself. ya know that gets me thinking……..just how fortunate we were to be able to choose between 2 quality wrestling shows at the same time. If WWF had D-Lo vs Val Venis “what’s on Nitro?” if WCW had Hugh Morrus vs Prince Iaukea “go back to WWF!” there was even a 3rd promotion that was putting out great stuff in ECW. back to Sting though. if only history could have been different………since WCW botched the Sting-Hogan match so bad, it could have been wrapped up so nicely if it was revealed Bret was NWO all along and screwed Sting at Starrcade. It could have kept that Survivor Series heat blazing and set up Sting vs Bret where Sting would have to leave WCW if he lost. And he would lose then go to the WWF to face their best and have a nice career BEFORE WCW died. Because it seems if you went there before WWE took over you were fine. It was only after that guys were getting buried. Funny isn’t it?? Sting was in tna four years even managed to have a match with a doped out of his skull Jeff Hardy with no issues. Comes to the wwe has 4 matches ends up with permanent injuries thanks to Seth Rollins bungling oh the irony!!! RD, not to be that guy, but it was Halloween Havoc 1990. Not 89. Considering how low rent TNA has always seemed I’m surprised it wasn’t just a pigeon. Know it makes sense that Sting is inducted into The Hall of Fame the same year as The Freebirds. strange indeed Gerard, Sting goes to WWE, where all these guys have to learn the WWE style and work “safe” and not have huge spot fest matches. Yet Sting is seriously injured in his 4th ever match after wresting Indy’s, NWA/WCW and TNA since 1985. Daniel Bryan starts in the Indy’s from 1999 and works spot fest matches for years. Gets to WWE, buried, goat face, VKM hates him but despite all of it he pull off the impossible and gets over and gets the belt. Then once he gets over, he gets “injured” working WWE style “safe” matches and is told by WWE his career is over and they won’t release him to work for other organizations and they blame his years of Indy matches as why he got injured. So not only does Vince bury guys that he didn’t create, he is now injuring them so they can’t work in the business as active wrestlers now. How can RD call that one of the worst themes in history? That’s really one of my favourites. It makes sense with her character and it sounds great.